Tired of damaged hair and split ends? Don’t go to the hairdressers just yet! There are things you can do to treat tired hair without cutting it off. Here are five tips! By brushing your hair properly before showering, you can avoid tangles and breakage associated with post-shower, towel-dried hair. Normal conditioners are great to make hair smooth and prevent the worst towel damage. But, when it comes to split ends, you need something more nourishing. Try a leave-in serum or leave-in treatment for long-term restoration. Heat tools can be incredibly damaging for your hair, so try to use them as little as possible. But if you absolutely must curl those locks, shield your hair with a protection spray. Hair oils are great for very damaged hair – they penetrate the hair strands and nourishes them from the inside out. Our hair oils contain Argan and Rose Oils, Burdock and Vitamin F for a lightweight, non-greasy formula. 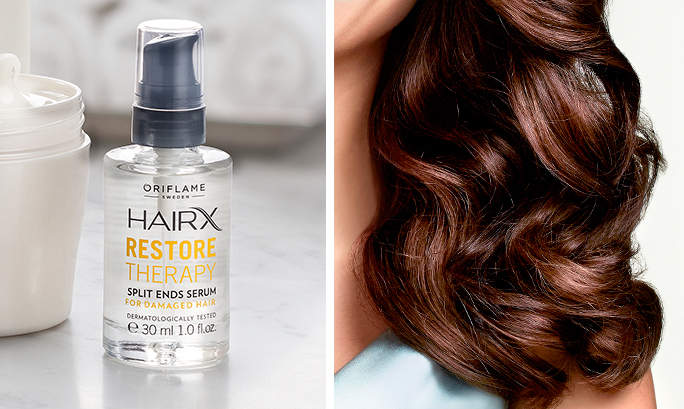 Just like your skin needs the occasional hydration boost, so does your hair. So, make a hair mask part of your weekly beauty regimen!